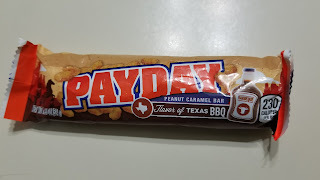 Okay, I admit it: I enjoy the occasional PayDay bar. When placed among other, more chocolatey creations in your supermarket's impulse buy aisle, the PayDay seems like the odd man out. It's salty, rather than sweet and it's chewy rather than melty. That's what I like about it. It's a change of pace. It clears the palate, thus readying your tastebuds for something like a Whatchamacallit. 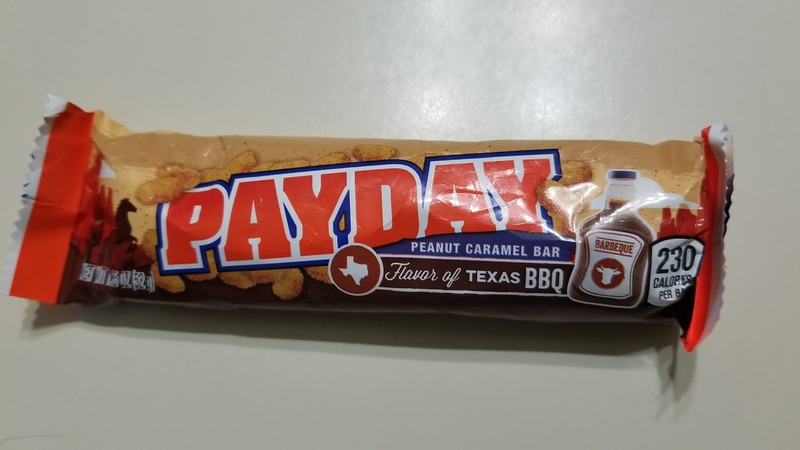 BBQ PayDay CandyBar. Try It If You Dare! That being said, I was taken aback when I was at the gas station this weekend buying fountain drinks for my wife and myself. While I was eyeing a pack of Mentos, the cashier shouted "You should try one of those BBQ PayDay bars" to me. I guess I was open to suggestions, because I picked one up. "Are they popular? ", I asked. "Nope. You're the first one to even consider buying one". I can understand why. The very thought of BBQ seasoning on a candy bar was enough to turn my stomach. Even worse, the candy bar itself looks, at best, like a regular PayDay that had been left outside all day. At worst, it looks like a PayDay bar that had been swallowed whole and crapped out the other end. I should have cut my losses, but, damn it, I spent a dollar on this thing (On Sale, no less! Damn gas station prices) and I wasn't about to let that money go to waste. If you're even remotely inclined to taste the BBQ PayDay yourself, let me save you the trouble. It taste likes sadness. It reminds me of those trick jellybeans that taste like awful things like boogers and grass. If the BBQ PayDay bar were a trick jellybean, its flavor would be "old socks". It's an attempt at adding a spicy kick to the usual salty taste and it just doesn't work. I think maybe PayDay should have gone the other way and coated the bar in sweet BBQ sauce rather than spicy BBQ flavoring. I picked up the Samsung Galaxy S8 Plus last week. My old Galaxy S6 Edge had taken a nasty spill on my driveway a few months ago and ended up with a cracked screen (this is why we can't have nice things) so I waited out my contract and upgraded to the Galaxy S8+ when the time came. Straight out of the box, I was struck immediately by two things: 1) It's a big phone and 2) I hope it doesn't explode. That being said, the Samsung Galaxy S8+ is an absolutely gorgeous phone with some amazing features and a few annoyances. The screen practically melts into the phone itself via a curve rather than an edge which makes the phone much easier to hold than the S7 Edge or the S6 Edge. This cuts down on accidental touch registers on the edges of the screen. The return of removable storage. The lack of an SD slot really annoyed me on my Galaxy S6 Edge. I had been taking pictures while camping and didn't have a decent cell connection so my photos didn't get backed up during the trip. My phone bricked near the end of the trip and I had no way to get into the phone and retrieve the pictures. The Galaxy S8 has brought back the SD card and now I'm happily saving my photos to my expandable storage again. IP68 water resistant compliance which means the S8 can endure being submerged in 5 feet of water for 30 minutes. Battery life so far has been great. My Galaxy S6 Edge could not survive the night on a full charge. The battery life on my Galaxy S8 Plus is much better, draining down to only 98% overnight from a full charge at bedtime. The Camera is phenomenal. Going from the S6 to the S8 is quite a jump, though my friends who have the S7 aren't nearly as impressed. It's so incredibly quick to snap that I feel I can take some great sport pictures. The native Samsung camera app has a bunch of Snapchat-like filters and flairs, but I have little use for them. The front camera has some pretty forgiving filters, thus ensuring that sleepy bedhead TommyMac is just a tad more dashing than usual. Bixby. It's Samsung's answer to Google Assistant and it's like some annoying helicopter mom decided that her previous Bixby needed some time in the Sun even though he's not nearly up to the task. Samsung has gone so far as to dedicate a physical button to launching Bixby and has been vigorously trying to destroy any attempts to remap that button to other uses (such as launching Google Assistant instead). Bixby is even integrated into the camera in order to perform Google Goggles type functions. It wouldn't be so bad if Bixby actually worked as intended, but, currently, many of its promised features aren't yet up-and-running. Without a case, the Galaxy S8 Plus feels very fragile. That's probably just because I'm a klutz, though. The fingerprint scanner is on the back of the phone next to the camera. Try not to smudge the camera lens if you often use the fingerprint scanner to unlock.